This may be old news to most of you but the long anticipated Video Copilot Element 3D is now available! Element 3D v2 – Element 3D allows you to import 3D objects created in Cinema 4D and OBJ into Adobe After Effects. From there you can manipulate them using a unique particle array system that can distribute 3D objects into any shape! Element 3D also supports your UV texture coordinates so importing and rebuilding your textures is easier than ever. This only brushes the surface of what Video Copilot Element 3D can create. Try it today and let your imagination come to life. 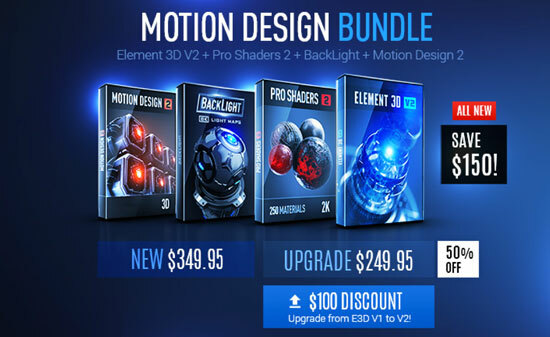 Upgrade your Element 3D to one of the new bundles! New for C4D Users: Element 3D V2 let’s you import most materials and textures from C4D automatically! New Specular Model! – The new spec model takes advantage of the new physical shader system and features a natural light falloff helps create more realistic shaders! You can even get the specular to be much smaller and sharp or large and diffused. May seem like a small thing but it makes a big difference! Video Copilot Pro Shaders v2 – Create amazing surfaces! 250 Tiled Materials for Element 3D. Metal, plastic, translucent, fabric, concrete, and more. Video Copilot Motion Design Pack v2 – A collection of 200+ Abstract 3D Design Objects and HD Models in Multiple 3D Formats that are ready to use inside your favorite 3D program including the powerful plug-in, Element 3D! 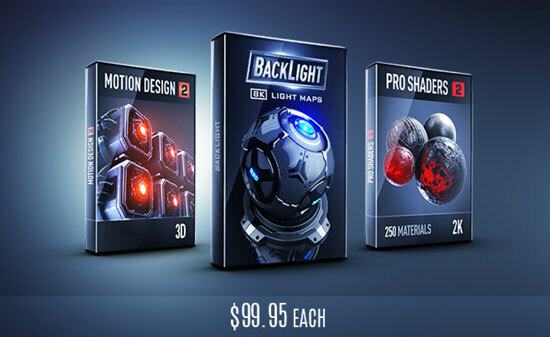 Video Copilot BackLight A collection of 50 Spherical Environment maps for lighting your scene and adding gorgeous reflections – 8K, 4K & 2K Environments, JPG & HDR formats. Use it for Studios Environments, hallways and more. Discounted Upgrade from Element – Save $100!